On November 18 – 19, 2015 Brazil will host the UN’s 2nd Global High Level Conference on Road Safety in Brasilia, convening national governments, cities, and civil society organizations. The conference is a unique moment to bring impetus to the Decade of Action at its mid-point – a time to reaffirm commitments and propose new strategies for the next five years in light of the new Sustainable Development Goals. Imagine a city where children not only walk to school, but where children are playing on the streets, walking to the park and biking to get an ice cream with their friends and families. Unfortunately, the current reality in many cities around the world is far from this vision. According to a 2008 World Health Organization (WHO) report, 21 percent of global traffic-related fatalities were among children under the age of 18, and traffic injuries were one of the leading causes of death for people under 20 years old. One main reason for this unacceptable health crisis is that our cities are not designed to be safe. 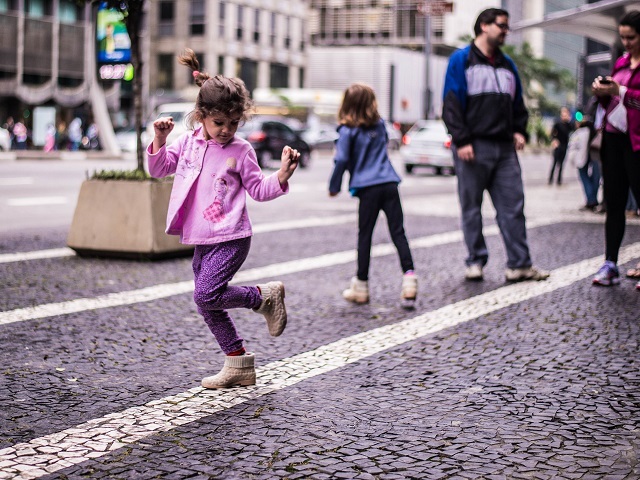 With wide and straight streets that allow several lanes of vehicles to travel at high speeds, it is no surprise that children in many cities are not able to safely move around their communities. If we design places that are safely accessible by children—the most vulnerable users of the road—we will improve safety and quality of life for all. Dense development, small blocks, connected streets, and mixed use will make for a safe and sustainable city. Further, speed management through compact and connected design, as well as speed calming measures are absolutely indispensable to protect lives. The final step is mass transportation as well as biking and walking facilities, which is a network that provides close-knit connectivity for urban residents. All of this shows that road safety and sound urban design go hand in hand. Awareness is growing at a global level that the number of children and family members lost to traffic crashes is unacceptable. Earlier this year, the United Nations member states agreed upon 17 Sustainable Development Goals (SDGs) that will guide the international community’s efforts to achieving major targets, such as the eradication of poverty. With two of these goals specifically addressing road safety and mobility, the SDGs are helping build significant momentum across borders. Goal 3.6 calls for the world to halve the number of global deaths and injuries from road traffic crashes by 2020. According to the World Health Organization’s (WHO) 2015 Global status report on road safety, 1.25 million people die every year from traffic crashes, and the majority of those fatalities occur in developing countries. Reducing this number by half and achieving this goal will only be possible if we address the root of the problem—urban design and sustainable mobility. Goal 11.2 provides critical support for this approach, calling on leaders to make safe, affordable, accessible, and sustainable transport systems a reality for all—including vulnerable populations like children—by 2030. Taken together, the SDGs are a robust opportunity for addressing urban design and mobility to improve road safety. It’s critical that we prioritize safe design and sustainable mobility now, as our world is transforming in an unprecedented way. 2.5 billion people will live in cities by 2050, which is the equivalent of building 290 cities the size of London in just 35 years. If car-centric development does not change, cities in the not-too-distant future will continue to be unsafe for children and all. However, widespread urbanization is also a chance to create more livable, sustainable cities. 75 percent of the infrastructure that will exist in cities in 2050 has yet to be built. The question is if our leaders will take advantage of urban growth to ensure safe and connected communities in the future. Investing now in compact development that is linked to sustainable transport will pay off in the future, as millions more people will be able to enjoy the quality of life that comes with living in safety. Consider, for example, Sao Paulo, where more than 1,300 people lose their lives to traffic crashes every year. Sao Paulo’s mayor, Fernando Haddad, has taken a lead in challenging the supremacy of the automobile. Hundreds of miles of bicycle and bus priority lanes have been constructed in the last few years. As a result of his initiatives, pedestrian fatalities fell by 18.5 percent, demonstrating how urban design and sustainable mobility contribute to road safety. Scaling up the kind of progress that cities like Sao Paulo have made requires a commitment to changing the mindset around road safety. Initiatives like Sweden’s Vision Zero are shifting the dialogue by inviting cities to aim for zero traffic fatalities and serious injuries, and the results are promising. A “safe systems” approach allows road transport systems to better accommodate human error, embracing a commitment to shared responsibility for road safety. A shared vision of zero fatalities among citizens, public, and private sectors is essential. Children should be able to go everywhere they need to safely. By focusing on the design of our cities and the role of safe access to mobility, we can turn this vision into reality.